What is Hot Topic? Hot Topic is a mall-based chain of retail stores that specializes in apparel, accessories, gifts, and music for teenagers. Walk into a store and the first thing you'll feel is energy. Energy from the music, energy from the merchandise, energy from the people. all of this is what makes Hot Topic different. The merchandise reflects a variety of music related lifestyles, which include street wear, retro influenced lounge, punk, club, and gothic. Add to that the wide selection of unique gifts and unusual accessories and you have it: Hot Topic is like no other store in the mall. History of Hot Topic Founder Orv Madden realized in 1988 that no other retailers were taking timely advantage of the direct correlation between music videos, alternative artists, and teenage fashions. Hot Topic takes its fashion cues from music videos, concerts, and music magazines and is always ahead of the curve. Many fashions worn by bands such as Korn, Linkin Park, and Good Charlotte have often appeared in Hot Topic stores prior to their wide spread popularity. If it's happening in music related fashion, it's happening at Hot Topic right now. What can you find in Hot Topic? Music is where Hot Topic began, and it firmly remains at the core of everything Hot Topic does. Hot Topic styles are influenced and reflect virtually all forms of rock music. Hot Topic carries the latest in street wear (Caffeine, Kikwear, GAT, and private label MT:2), club (want vinyl? Hot Topic has it in tops and bottoms for men and women), lounge (Lucky 13, Casino Wear and Johnny Suede), and punk (Lip Service, Serious and Tripp). Hot Topic also has its own line of private label apparel, Morbid Threads. In addition, the stores carry a wide assortment of licensed band merchandise (T-shirts, stickers, patches, hats, etc.). Accessorize, accessorize, accessorize! 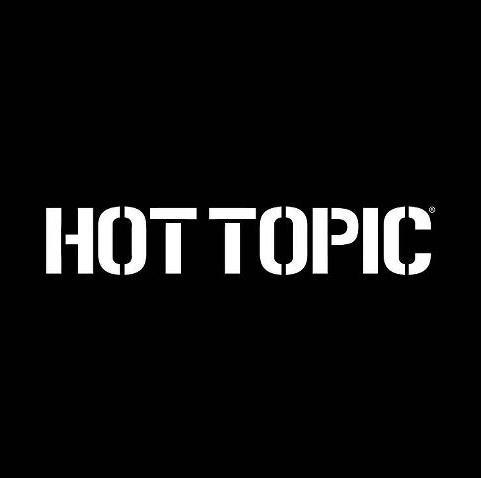 Hot Topic has lingerie, hosiery, cosmetics, belts, handbags, shoes, and Morbid Metals; Hot Topic's very own line of body jewelry. Need some glitter make-up? A silver skull ring? Looking for that messenger bag? What about those shoes for the concert tonight? Ever thought about dying your hair Cupcake Pink? You can find it all in one place. Hot Topic also has those gifts you can't find anywhere else. Whether you want a journal, an Invader Zim plush, a Grumpy Bear inflatable chair for your room, candles, a Simpsons Auto Sun Shade for your car, the latest issue of your favorite music magazine, or collectible action figures, it's all here!